THIS WEEK IN NINJA-ING: Thursday's Book of the Week is The Girl Who Remembered Horses by our old friend, Linda Benson, who has already faced the 7 Questions. Wednesday we're discussing Chapter 3 of Harry Potter and the Goblet of Fire, and Saturday, as ever, we'll be joined by a surprise literary agent. But today and tomorrow I've got a two-part post for you about television. Do you love television, Esteemed Reader? Hate it? Me, I both love and hate television as I used to both love and hate cigarettes. I suppose that might be a controversial topic on a blog about books marketed to children, but honesty is what brings readers back for more. The awful truth: cigarettes are tasty and enjoyable to smoke. That's why I spent so much money on them:) That's why I was willing to put up with the side-eyed glares of so many folks at writers conferences when I came back inside reeking of ash and a building nest of cancer (I'm aware some of you Esteemed Readers are giving me side-eyed glares even now). That's why I was willing to put up with the hacking cough that never went away and the bit of spit-up in the mornings as I brushed my yellowed teeth. Stephen King smoked. So did J.K. Rowling, Roald Dahl, John Steinbeck, Mark Twain, and a whole host of other writers greater at the craft of fiction than I could ever hope to be. I thought myself quite cool in college smoking cigarettes all night and swilling coffee and writing until the wee morning hours just like a real writer. What finally broke me was the realization that smoking was no longer something I did by choice. The cost of smoking in recent years has become prohibitive (good) and I was literally setting 200 to 300 bucks on fire a month. Once, more than a decade ago, after being laid off from a job, I felt I had to ration what little money I had to make sure I could afford both food and cigarettes. That's when I knew for sure cigarettes weren't something cool and fun. They were a monkey on my back. The thing about a junkie is he's usually got more than one bad habit. Will-power is finite and fragile. By lighting up a cigarette first thing every morning instead of exercising, I was signalling to myself that engaging in nasty, addictive behavior throughout the day was acceptable. Diets were difficult to maintain as were other disciplines. There isn't a smoker in America who doesn't know smoking is bad for them and by engaging in slow suicide, they open the door for other bad decisions to follow. To this day, if I'm around smokers, I have to bite my tongue to keep from asking to bum a smoke. But I remember that the pleasure the cigarette would give me is far outweighed by the consequences of being snared once again. I have no wish to spend my days a slave to big tobacco. And I like being healthier, feeling better, and not having to deal with the negative social connotations of smoking. When I see a cigarette, I have to remember it is a dangerous thing not to be trusted. It's almost as dangerous as a television. Oh television, how I love you. You've given me The Simpsons, Quantum Leap, The Walking Dead, Breaking Bad, Batman, Batman: The Animated Series, and Smallville. How I've loved trying to solve medical mysteries with Dr. House, despite my complete lack of medical knowledge! What joy I've felt laughing at Seinfeld and It's Always Sunny in Philadelphia, what rapture to hunt the terrorists with Jack Bauer in 24. That last was a Simpsons quote, but I'll bet most of you Esteemed Readers already knew that. I could quote The Simpsons all day if I choo-choo-choose to, and I know many of you could as well. Television is a shared experience. We can meet someone new from a completely different set of circumstances from our own and share some similar viewpoints because of the impact television has had on our collective culture. For that reason, I've never understood writers who give up television completely. In my day job I was chatting with a client who made a reference to an apparently popular television commercial and was annoyed I didn't laugh. I had to explain I haven't owned a television for a year and I haven't seen the commercial. In a way, it amuses me this fellow felt slighted by my failing to recognize the height of his wit was parroting the tag line of a corporation. But in another, far more tangible way, it cost me. The ninja works in sales and I didn't make that sale. The client felt separate and apart from me because I didn't share his cultural touchstone, and I have no doubt this separation will deepen the longer I'm away from television. I didn't realize what a big deal television is until mine was stolen a year ago. When I've gone to visit friends and family, I've noticed their televisions in a manner I never did before. We might be sitting in a living room chatting, the volume on their television turned low, but not off. That way, throughout the conversation, whenever there's a lull, we can glance at the screen and check the sports scores or see if somebody's killing somebody else. 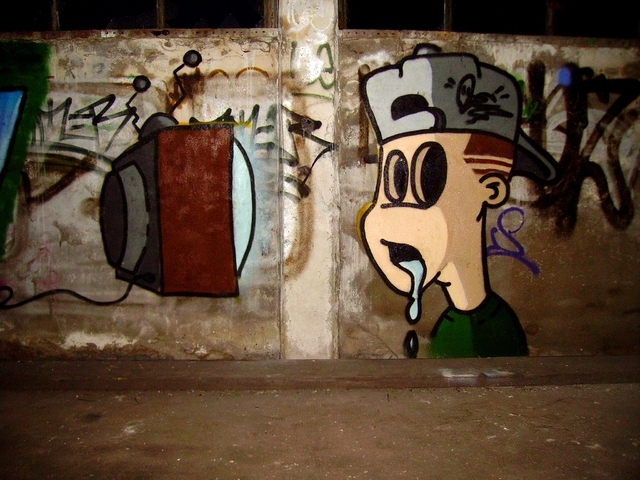 Television is the unacknowledged guest in the room. I've noticed when people come to visit me and we chat in my barren front room, visitors glance nervously around for something missing. It's not quite the shuffle of a junkie away from their stash, but there is something hungry and furtive about their roving glances, searching the room as though I've merely hidden the television. The decor of most American front rooms may vary in the quality and amount of furniture, framed photos, paintings, etc., but the majority of American family rooms are dominated by the prominent placement of a television, usually the largest they can afford. My buddy's got 42 inches of sweet high definition TV in his room, I used to have 55 inches (in 3D! ), and my old boss had 70 inches so we all knew he could afford them. His was bigger, so he won... I guess. Good for him.